Please select the size of the Dirndl. Traditional dirndl in classic black for a fabulous look. 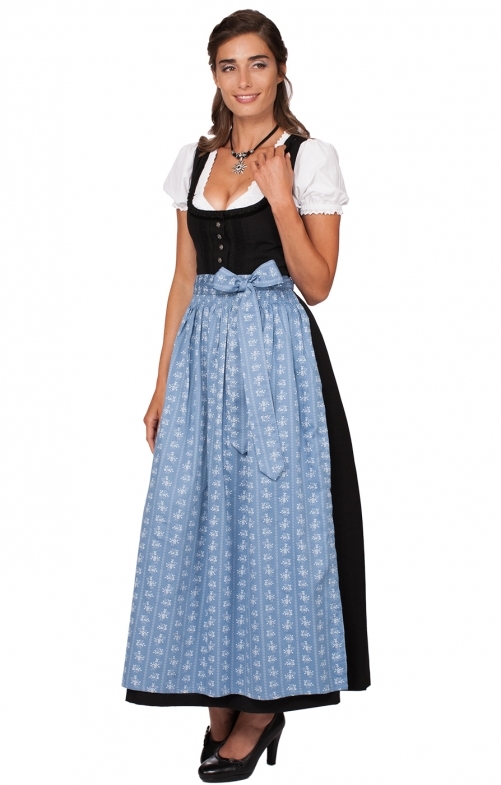 This traditional one-piece dirndl in classic black creates a fabulous look. Cut to fall attractively below the knee, emphasising your feminine outline, this beautiful dirndl features stunning workmanship. The bodice has a wealth of detail to subtly draw the eye, including rich braiding and miniature bows, complemented by similar bows around the neckline. Silver filigree flowers, each highlighted with a tiny lustrous pearl, give delicate contrast. Simply choose from our range of pretty dirndl blouses and colourful aprons to add to this dirndl, and create a delightful outfit for any occasion.